Mighty opposites; Hamlet and Claudius: In the play 'Hamlet', the drama is essentially a contest between Hamlet and Claudius, with the outcome inevitably being the death of one of them. Claudius is Hamlet's uncle who has married Gertrude, Hamlet's mother after the death of King Hamlet. Both characters are presented in Act One. Hamlet is presented as a youthful, innocent and heroic prince sincerely grieving for the loss of his father. His grief for his father is the initial image we get of Hamlet which also corresponds to him being innocent and honourable. In contrast to Hamlet who is genuinely distraught and bewildered, Claudius is introduced in his court speech as someone manipulative and in control. He is calculating as how he should appear, it is not emotional and he is using this image to mask the true situation, (i.e. killing his brother) and to gain acceptance from the audience. ''it us befitted to bear our hearts....that we with the wisest sorrow think of him''. 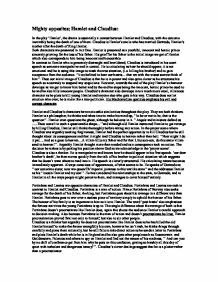 Thus our initial image of Claudius is that he is in power and also quite clever as he structures his speech so accurately to suspend any suspicions. However, towards the end of the play Hamlet's character develops as we get to know him better and by the end he stops being the innocent, heroic prince he used to be and he also kills innocent people. Claudius's character also develops into a much more cruel, villainous character as he plots to kill young Hamlet and anyone else who gets in his way. Claudius does not let emotion take over; he is more like a true politician. His Machiavellian qualities emphasis his evil and corrupt character. 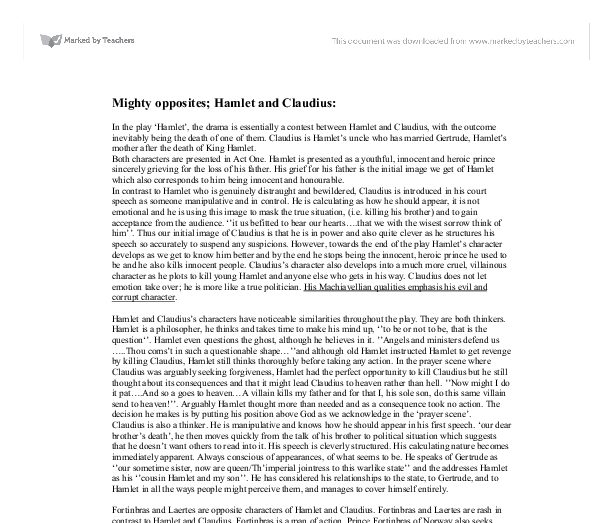 Hamlet and Claudius's characters have noticeable similarities throughout the play. They are both thinkers. Hamlet is a philosopher, he thinks and takes time to make his mind up, ''to be or not to be, that is the question''. ...read more. This is shown in the play when Hamlet tells Ophelia: 'god hath given you one face and you make yourselves another', arguably Hamlet is referring to his mother as well. His mistrust for women can be a result of his mother's marriage to Claudius (his father's murderer). He verbally abuses Ophelia, using sexual innuendo and derision and he encourages her to get to a 'nunnery'. Another play on words, 'nunnery' in this instance symbolizes both sexual abstinence and sexual perversity. In Elizabethan times 'nunnery' is brothel. Hamlet uses this word to stop all the temptation of Ophelia tricking men and that in a brothel, she would serve as the basest sexual object. His view on women could be as a result of his mother's actions. Claudius and Gertrude were also lovers at the beginning of the play. There is also the suspicion that they had an affair even when Old Hamlet was alive. 'our sometime sister now our Queen' is ironic in Claudius's court speech because you wouldn't marry your sister in law. Claudius's marriage to Gertrude is regarded as incestuous by Elizabethan audience. In some senses Claudius betrays Gertrude in a much more cruel way as he lies to her right from the start about Old Hamlet's death and later plotting to kill her son. Claudius and Hamlet are both murderers, they are both ruthless and kill innocent people throughout the play. Eight characters in the play meet violent ends, if Ophelia's doubtful death is included. This doesn't include Old Hamlet's murder, which is the spring that drives the revenge that is the heart of the play. Hamlet's first long speech in Act one, scene two, shows he is so sick of life that he wishes it were not a sin to commit suicide. 'gaisnt self-slaughter!' the contrast between life and death is constantly brought to the foreground by Hamlet's soliloquies, by the graveyard scene and by the deaths that begin to occur with increasing rapidity as the play progresses in Act five. ...read more. Looking at the structure of the play it takes Hamlet a long time to get to his final revenge. Four acts out of the whole play (five acts) Hamlet has been making his mind up and suddenly he realises its time for action in Act five where almost all deaths take place. In some ways, Claudius exhibits more heroism than Hamlet. He manipulates fortune and takes what is not rightfully his, but remains unapologetic for his actions; he possesses enough strength to admit that he would do the same again. Hamlet, torn by conscience to smite the morally deficient Claudius, causes the death of six innocent people before he accomplishes his goal. By taking full responsibility for his actions, Claudius mitigates his evil nature. The mark of a great Shakespearean antagonist is how completely he mirrors the protagonist. Claudius is no more Machiavellian than Hamlet; both ultimately believe that the end justifies the means, and both ultimately sacrifice humanity and humaneness in the acquisition of their goals. Hamlet has a eulogy, Claudius doesn't. Claudius's death is cowardly, a well deserved death as everyone realises his true character at the end of the play, whereas Hamlet has the heroic image in the play, he dies at the end of the play in the hands of his grateful friend, Horatio. He is also the last person to die which again reflects his heroic character. Hamlet dies but his memory stands in the hands of Horatio, his only faithful friend and he will be the one to give the audience and others the impression of Hamlet's heroic character. Horatio: 'Even while men's minds are wild, lest more mischance on plots and errors happen'. Hamlet's justification for all the crimes he has committed is reinforced through that he was instructed to take revenge by the soul of his great father, King Hamlet. He even took a great amount of time, overcoming his moral dilemma and his heroism lied in the hand of his best friend, Horatio. ...read more. Claudius but he chooses not to: '...now a is a - praying, And now I'll do't - and so a goes to heaven...' Act 3-3-73/74 The use of caesura in the line displays Hamlet's confused and disturbed mind and demonstrates his uncertainty of his preceding actions at this point. He wants his perfect revenge, one that would satisfy his meticulously accomplished conscience, but he is hesitant on whether he can carry it out or not, so instead he declines it altogether or at least puts it off in stages, until he can prove it to himself and can put it off no longer. Morally,due to the fact that she married her husband's brother which at the time was considered incestuous. This quote could also apply to Hamlet and his view on Ophelia. When Hamlet states that women are frail, he could be making reference to Ophelia weak hearted and easily manipulated by other. His political skills, which he uses to corrupt family and friends eventually, lead to the death of all the main characters of the play (with the exception of Horatio). Claudius' power of corruption, to a certain extent, reveals a lot about his character as a sneaky and devilish person. Hamlet feels trapped in this paradox. We only see Hamlet's true state of mind at this time, in this soliloquy. Hamlet again continues to almost delay avenging his father's death and in doing so expresses a need for proof of Claudius' guilt. as the ghost says and to kill Claudius and his conscience or religious background which tells him that ghosts are evil and that murder is wrong. This is an example of Shakespeare trying to assert Catholic morals in the play. Claudius really did kill king Hamlet and also to put on an act of insanity to fol those around him. Claudius becomes suspicious of Hamlet and decides that Hamlet must be sent to England but is talked out of it by Gertrude.